Kensington, New Hampshire was recently the site of an early evening DWI-related accident. A Seabrook man ran his car off the road, through a stone wall, and into a utility pole, right in front of the Kensington Police Department headquarters. Police were on the scene immediately. What they found on scene was one Joshua Tackett, age 29. Tackett only suffered minor injuries, although his car was badly damaged. No official details pertaining to Tackett’s blood alcohol content have been revealed, however, police say that the primary contributing factors to the accident were likely speed and alcohol. 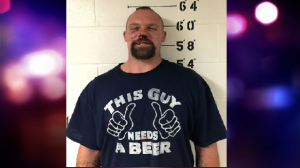 While Tackett’s blood alcohol content remains a mystery, a mugshot of a grinning Tackett sporting a shirt bearing the phrase “This Guy Needs A Beer” has appeared in several news stories online. He now faces charges for driving while intoxicated. He was later released on $750 bail. While Tackett’s shirt may have a humorous and ironic role in his tale, the DWI charges he faces are no laughing matter. Though it is unclear what DWI and/or related charges Tackett now faces following the incident, one thing is very clear: Tackett is in need of an attorney. DWI charges are serious, and can land a person with long term consequences. If this is Tackett’s first DWI charge, he will face a fine of at least $500 and potential license suspension of up to 24 months. Though no details were released on his speed, if officers are somehow able to prove he was traveling over 30 miles per hour over the posted speed limit, he may end up facing aggravated DWI charges, which can drastically increase sentencing for both incarceration time and fines. Aggravated DWI in NH increases fine to a minimum of $750, minimum 17 days in jail and license loss of 18 months up to 2 years. What was likely supposed to be a fun night out for Tackett is now becoming a potentially life-altering event. Tackett will need an attorney to give him the best chance at a favorable outcome. Shortly following the incident itself, the Kensington Police Department issued a statement which highlighted the fact that DWI and distracted driving have been the cause of a number of serious accidents in 2016, including a rollover accident in February that ended with three deaths. The statement then went on to discuss the importance of either putting down the phone or finding a designated driver. If you or a loved one is currently facing DWI charges in New Hampshire, you will want a skilled and experienced DWI attorney. Contact the DWI legal team at Tenn And Tenn today.